The MCP1810 is a 150 mA (for VR ≤ 3.5V), 100 mA (for VR > 3.5V) low dropout (LDO) linear regulator that provides high-current and low-output voltages, while maintaining an ultra-low 20 nA of quiescent current during device operation. In addition, the MCP1810 can be shut down for an even lower 1 nA (typical) supply current draw. The MCP1810 comes in six standard fixed output-voltage versions: 1.2V, 1.8V, 2.5V, 3.0V, 3.3V and 4.2V. The 150 mA output current capability, combined with the low output-voltage capability, make the MCP1810 a good choice for new ultra-long-life LDO applications that have high-current demands, but require ultra-low power consumption during sleep states. The MCP1810 is stable with ceramic output capacitors that inherently provide lower output noise and reduce the size and cost of the entire regulator solution. Only 1 µF (2.2 µF recommended) of output capacitance is needed to stabilize the LDO. 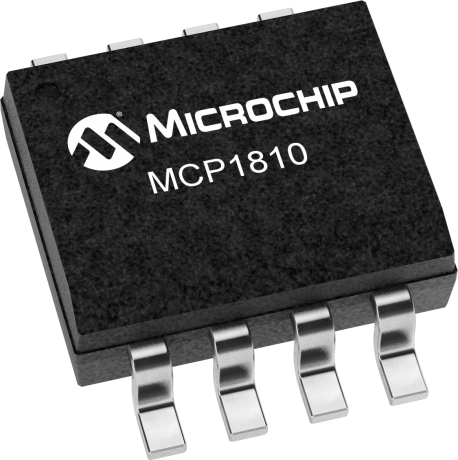 The MCP1810 ultra-low quiescent and shutdown current allows it to be paired with other ultra-low current draw devices, such as Microchip’s nanoWatt eXtreme Low Power (XLP) technology devices, for a complete ultra-low power solution.